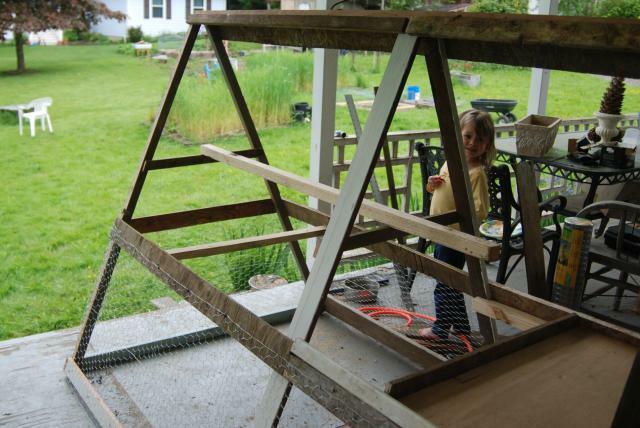 Here is the chicken tractor I built out of scraps! The only thing I bought new was the chicken wire. I did buy the hinges and wheels at yard sales. Everything else we had lying around. I didn't even have to buy nails or screws because we had some left over from another project. ***WARNING*** This chicken tractor was not made to be cute or pretty. It was made to be functional and was made as cheaply as possible. 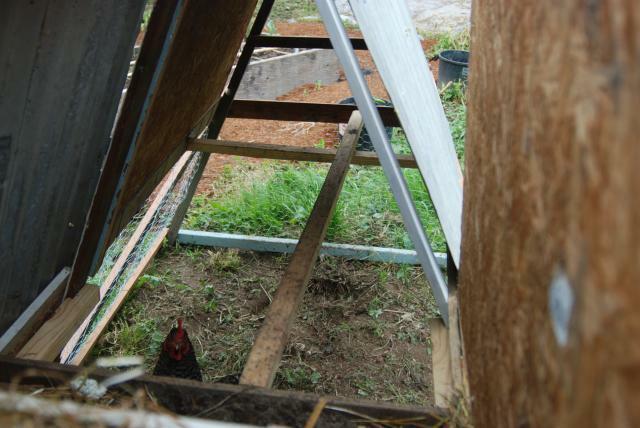 I didn't follow any specific plans to build this coop. 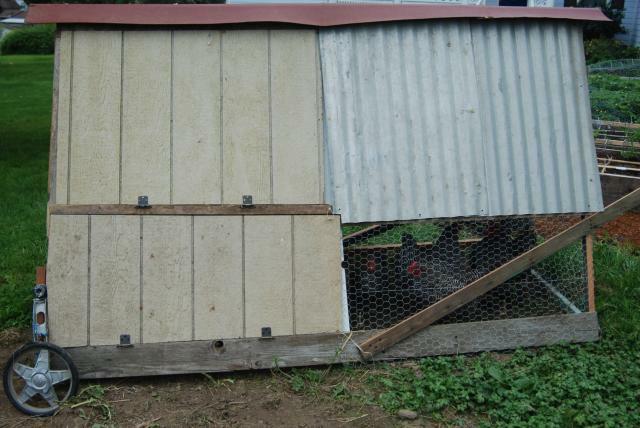 I studied all the chicken tractors on BYC and read the comments of what people liked and didn't like about their coops and I took into account what I liked and didn't like about our non-portable chicken coop. I gathered all the available wood, took the 3 longest pieces (ripped one so I had 4 long pieces), cut them all to the same length (just under 8 ft). I then cut the second longest pieces to 5ft and ripped several of them and tada! I had an A-frame. The finished measurments are roughly 4ft wide x 8ft long x 4 1/2ft tall. 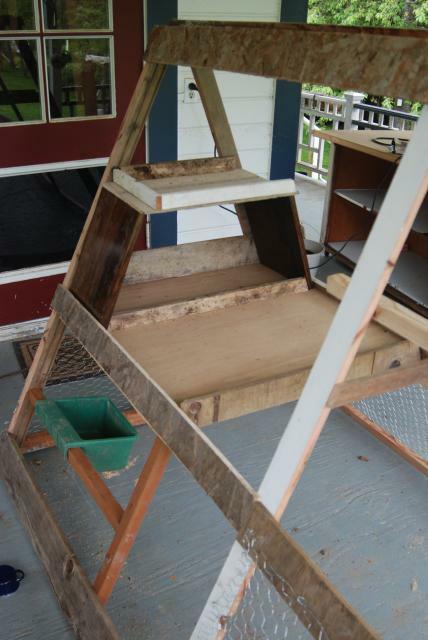 I used a hollow core door cut in half for the "loft" which holds the nesting boxes and the sand box. The nesting boxes are left over pieces from a very nice shelving unit DH made (if you look close you can see that it is stained and varnished ) and bits and pieces of other random wood. The nesting box is not actually attached to anything, it just fits snugly. so if I need to really scrub things down, I can. The frame is done and the wire is on! 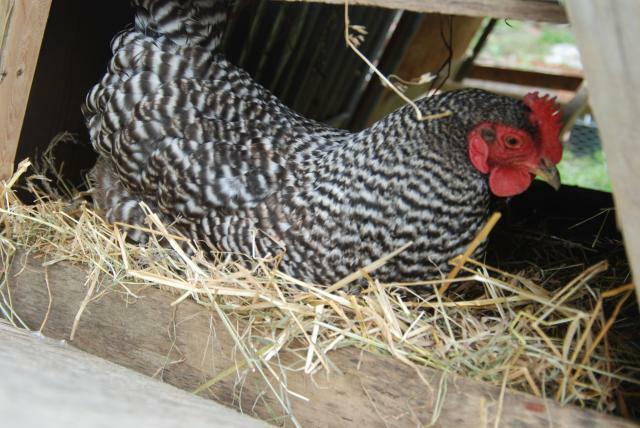 I did end up moving the roosting stick after I took this picture. Here are the nesting boxes and sand box. The front section I filled with sand so they can still dust bathe while I have them on the grass. The chickens have moved in! DH helped me dissect a golf caddy that I bought at a yard sale. From it we got nice strong aluminum wheels. The handles are just a ripped 6ft 1x6. Here is the roosting sticks. This side has two doors. The lower one is where the food and water are. So that's it! I told you it wasn't pretty, but it is very functional! Good use of reclaimed materials. 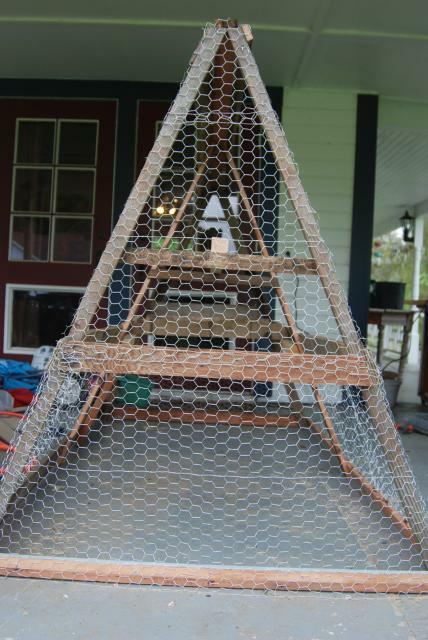 Would it be netter to use welded mesh rather than chicken wire for added security? I think they look cramped too. I think it is due to all the cross pieces. Those are likely not needed as an A frame gets its strength from the triangle shape. The chicken wire is unlikely to stop a dog. I do like the tip our access door. 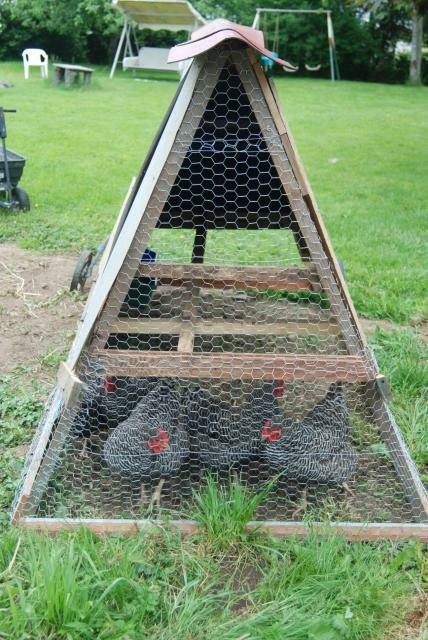 "Run could use a little more space"
Overall, the design of this A-Frame coop is not bad. One thing that I would change is the run. I would make it a little taller and wider, as the birds look a little cramped. 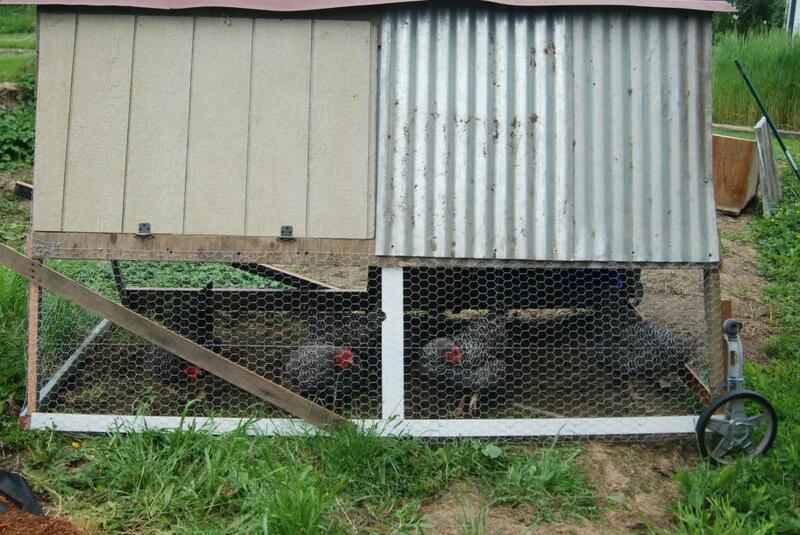 I would also make this coop easier to access. Think about how you'd get to an egg laid in the run. Looks great to me. I'm hoping the hubby and I can do something similar with scraps we have around the place. He's promised to start a chicken quarantine tractor for me this weekend. I'm going to make him look at this. 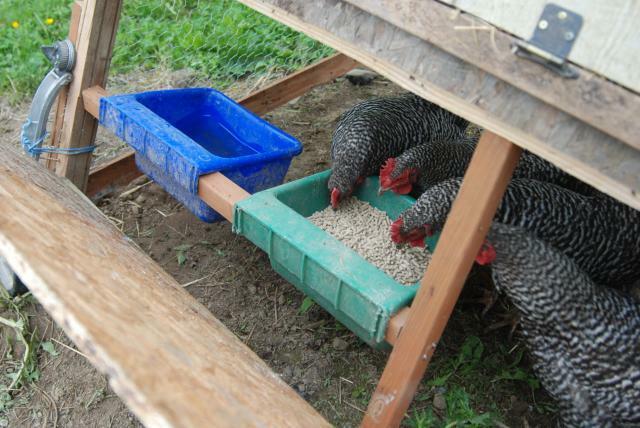 You went "green" by recycling old parts, it was nearly free, and the chickens can be easily moved to fresh grass and weeds - which of course makes the eggs delicious! Way to go! The chickens look happy! That is all that matters!